Is your lack of sleep costing you more than irritability? Is your lack of sleep costing you more than irritability? How many hours sleep do you get on average each night? Is it seven or eight? More? Way less? If you are like many Australians, it is probably on the way less side. Sleep is a vital time for the body to repair and restore itself, and this includes your physical body and your mind. Growing research into sleep has uncovered some alarming facts about the effects of a lack of sleep. It appears that Australia is in the grip of a sleep deprivation epidemic, according to research by the Sleep Health Foundation. It is dragging down the nation’s productivity, risking safety and damaging mental health. The research found 33 to 45 per cent of adults sleep either poorly or not long enough most nights, leaving them to face the new day with fatigue, irritability and other side effects of sleep deprivation. On average, Australians get 6.5 hours sleep a night, but 12 per cent clock up 5.5 hours or less. Research by Deloitte Access Economics in 2017 found more than seven million people don’t get enough sleep with a cost to the economy of around $66 billion. Some of the common causes of lack of sleep include stress, disorders like sleep apnoea, lifestyle factors, over-use of ‘gadgets’ and the use of screened devices in the bedroom. With Sleep Awareness Week being held from October 1 – 8 is, what better time than now to share some insights and tips into why and how you can increase your sleep; quality and hours, and the bottom line of your business? Between seven and nine hours sleep are the recommended amount. So, if you are someone who thrives on four or five hours of sleep every night, and considers sleep a luxury, you might like to think again. What happens when you have a lack of sleep? With a lack of sleep, you may have trouble concentrating, making decisions, being productive and getting things done. It’s more difficult to focus and pay attention, so you’re more easily confused. This hampers your ability to perform tasks that require logical reasoning or complex thought. You get irritable, short-tempered and are often unpleasant to be around. In one study, subjects who slept four and a half hours per night reported feeling more stressed, sad, angry, and mentally exhausted. Given that a single sleepless night can cause people to be irritable the following day, chronic insufficient sleep may lead to long-term mood disorders, such as depression, anxiety, and mental distress and other health problems including obesity, diabetes, cardiovascular disease, and even early mortality, according to a 2007 Harvard Report. Lack of sleep impairs your decision-making skills. Sleepiness also impairs judgment. We all know how alcohol impairs our motor and decision-making skills, but being sleep-deprived can impair you by as much as fifty-percent. The Harvard study showed that some of the deadliest accidents in recent history could be related to sleep deprivation, including, the report noted, the 1979 nuclear accident at Three Mile Island, the 1986 nuclear meltdown at Chernobyl, and the grounding of the Exxon Valdez. Other potential implications of a lack of sleep are cardiovascular disease, stroke, obesity, diabetes, depression, and social withdrawal. The National Sleep Foundation (NSF) states people are 12 per cent more likely to die early if they don’t get the recommended seven to nine hours of sleep every night. Yikes. So how much is the right amount? Most research says between seven and nine hours is ideal. But beware. Some research has stated that too much sleep – over ten hours regularly could also be detrimental. However, as more people suffer from a lack of sleep, here’s a quick summary of the benefits of getting a good night sleep. More focus. When you are feeling awake your mind has an easier time staying clear and sharp and you will be able to concentrate on your project or goals. You will learn better, remember more and have sharper insights and ability to make decisions. how many important decisions are you responsible for making every day in your business or work? The NSF shows that decision-making skills can improve by as much as 4 per cent with a good night’s sleep. Not to mention that you will probably feel way better – more alive, alert, focused, healthier and happier. Be consistent in your sleep routine. Keep your routine as regular as possible. Even if a work event meant a late night or two in the week, try not to catch up at the weekend, as you are ‘fighting’ the body’s natural cycles. Set your alarm for a similar time and get up anyway. Try testing changing your waking up time, and keep a diary of how you feel – when you feel tired and when you are more awake. Work out, with this proof, what your optimal number of hours sleep is. You may discover, as I did, that when I got up earlier and exercised I was no more tired than when I slept later! 2. Avoid blue light one to two hours before bed. Turn off your computer and gadgets at least one hour before bed and don’t use your gadgets to read at bedtime. Stop checking your social media accounts and facebook posts! Turn your phone off. Blue light emitted from most electronic gadgets destroys melatonin, one of the hormones that help you sleep. Read, relax or find a different way to unwind. You might find the art of conversation or reading a book quite liberating! Yes, stress will negatively impact your sleep. If you have a lot going on in your mind, write it down. Create a list of things that need to be done. This will prevent you from waking up in the middle of the night thinking about all those things you didn’t do. If you have worries or concerns, take some time journalling them on a piece of paper. Most of our worries are inflated by our over-thinking minds and are usually never as bad as we imagine them to be. Learn some simple meditation techniques or conscious breathing practices to still your mind before bed-time. 4. Create rituals around your sleep. The more you create rituals at the start and the end of your day, the more in control of your life you will feel. Rituals are like keystone habits for your day and ultimately your life. Create a few simple rituals before you go to bed, such as meditating or practising relaxation; writing down three things you did well or focusing on what you are grateful for. These help you take charge and set yourself up for a good night’s sleep. By focusing on what you did well and what you are grateful for will help you feel better. As your body creates chemicals that match your feelings, you are conditioning yourself to naturally create good chemicals more often. A natural antidote to stress. Start your day with a set of healthy rituals. Decide in advance what time you will get up and what you will do upon waking. For example, it might be exercising, drinking a glass of water, eating a healthy breakfast, walking your dog, planning your day, or connecting with your goals. Morning rituals will improve the rest of you day. Guaranteed. You will be more productive, feel more accomplished and ultimately feel in a better mood. And of course, success fuels more success. When we feel successful we will sleep better. Most people are way too busy. Have at least one night a week which is your designated self-care night. Make it a non-negotiable. Aim to make this one of your keystone habits in your life. Read a book, play cards, watch something funny, have a bath or simply do nothing. Go to bed early. As you have gone to bed early, wake up a few minutes earlier and give yourself the gift of time to do something just for you. Do something that you enjoy or makes you feel good. The more you stick with this consistently the more you will create this as a normal and natural habit that is an important part of your life. Eat less at night and cut down the number of hours for your ‘feeding window,’ You may have heard of intermittent fasting? Research has shown that the benefits of intermittent fasting are vast. One of which is improved sleep as well as more energy. Check out the fast diet. Exercise without a doubt is probably the greatest activity you can participate in to help improve your night’s sleep. In one research study, people who exercise all advised they slept better. Not only does it physically make you tired but it creates endorphins which help you feel better. When you feel better you will be more productive and fulfilled and likely to sleep better. And of course, exercise is a positive health benefit! Ultimately, you are the one who should determine exactly how much sleep you need and if you suffer from a lack of sleep. Decide today that getting a good night’s sleep consistently is of high importance to you living a fulfilled, productive and healthy life. Take some time creating good habits and rituals around sleep. Create a good sleep environment and persist with strategies and rigorous testing and measuring to ensure that your habits support your optimal night’s sleep. Not only will your mood improve, but so will your health, productivity and life fulfilment. And that has to be a good thing! 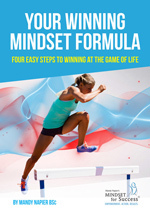 Mandy Napier is a Global Mindset & Performance Coach who inspires people to get out of their own way, step up and become the peak performer in every area of their lives; living their true potential. As an authentic, and inspirational coach and speaker, she partners with professionals and teams to create transformations and lasting results. Or, if you want to be consistent in the area of food and eating, or even shedding a few kilos, I have researched and written a short report on three ways to free yourself from the agony of dieting. Want to check it out? Download my free PDF guide “Free Yourself From The Agony Of Dieting”.